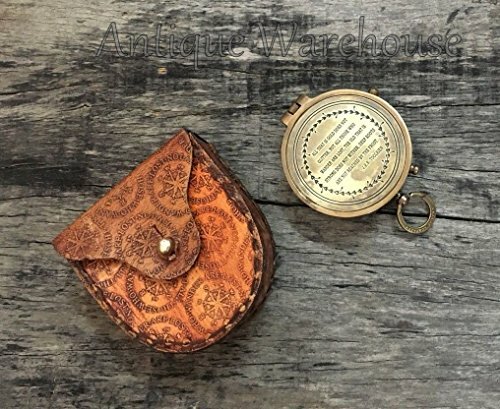 Nautical Antique Brass Working Compass Maritime Marine Pocket Compass With Leather Stamped Case. Nautical Antique Brass Pocket Compasses - Nautical Decor Home Decoration - Executive Promotional Gift. This functioning brass compass with VINTAGE LOOK is approximately 2" in diameter. Compasses have been used for years to help travelers determine their location as well as the location of their destination. Used while hunting, camping, hiking or working, the compass can be a lost individual's most prized possession. Unique Design Made Of Solid Brass With Accurate Efficiency. Points Towards Magnetic North Pole. The Perfect Gift for Travelers, Nautical Collector's and Table Décor. If you have any questions about this product by Antique House, contact us by completing and submitting the form below. If you are looking for a specif part number, please include it with your message.